An essential reference tool that picks up where Bartlett’s leaves off, the Book of Science and Nature Quotations is a unique compendium of over 2,000 fascinating reflections on every discipline of the sciences, from aeronautics to zoology, dating from the eleventh century B.C. to the present day. 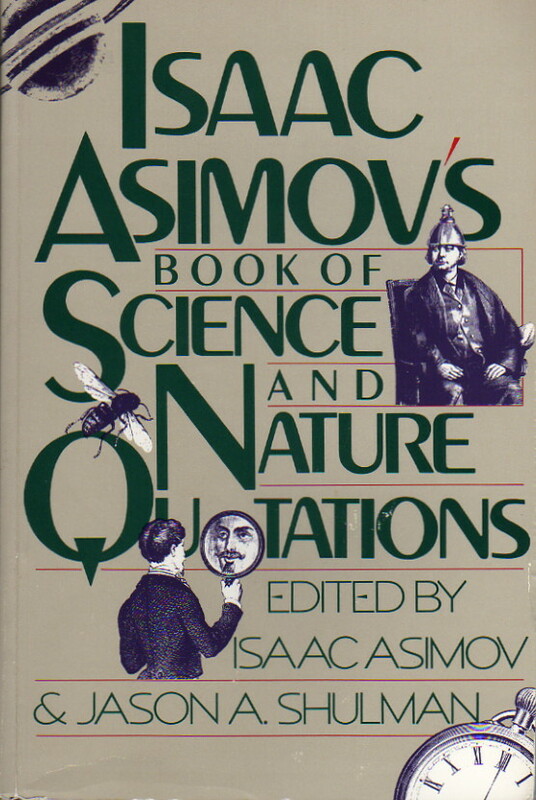 As edited by Isaac Asimov, the preeminent science writer of his generation, it provides an accessible and enjoyable history of science in the words of its most illustrious practitioners, commentators, and critics—from Galileo, Newton, and Da Vinci to Einstein, Freud, and Curie. Here the reader will find the beginnings of aviation and the evolutionist controversy, the discovery of King Tutankhamen’s tomb and the computer revolution—in short, all the moments of great wisdom (and equally great ignorance) that have characterized and defined man’s search for knowledge throughout the ages. Rather than a list of assorted facts and dates, the Book of Science and Nature Quotations is a treasury of provocative and exciting information that reveals the poetry of science—the ways in which our perceptions of ourselves and our environment have been modified and adapted over time. This is another book, like Isaac Asimov’s Book of Facts, which one rather resents the Good Doctor having counted, as it’s clear that his own contribution to the book was minimal (and rather suspects that it was mostly limited to the introduction and chapter headers). As for the book itself, my reaction is still not terribly positive. I’m not a big fan of quotation books, since as I see it, they‘re basically intended to make it possible for public speakers to sound impressively well-read without going to the trouble of actually reading anything. The quotations per se are fine, but they aren’t always exact quotes, but since they have no notations, either, beyond the author’s name, it isn’t always easy to confirm that. Even quotes from the Bible are just cited as “the Bible,” as opposed to say “Genesis 1:11-13” (heck, I don’t even know which Bible translation they‘re using, which annoys me no end). On the whole, then, I really can’t recommend this book for much.